His eminence with Yildiz discussed bilateral relations between the two countries and the importance of developing them to serve the interests of both peoples. His eminence pointed to many commonalities between Iraq and Turkey, so to set more progress in way forward. His eminence called neighboring countries to support Iraq and its security and stability as it impacts on security and stability of countries. His eminence explained that Iraq has succeeded in defeating terrorism, promoting unity anf the peaceful transfer of power and roles, indicated that the Al-Hikma Movement authorized the Prime Minister-designate to assign who he sees fit for the government posts of the Al-Hikma bloc, pointed out that this step comes out of "our conviction to phase needs to devote efforts in order to achieve the aspirations of the Iraqi people and provide services." 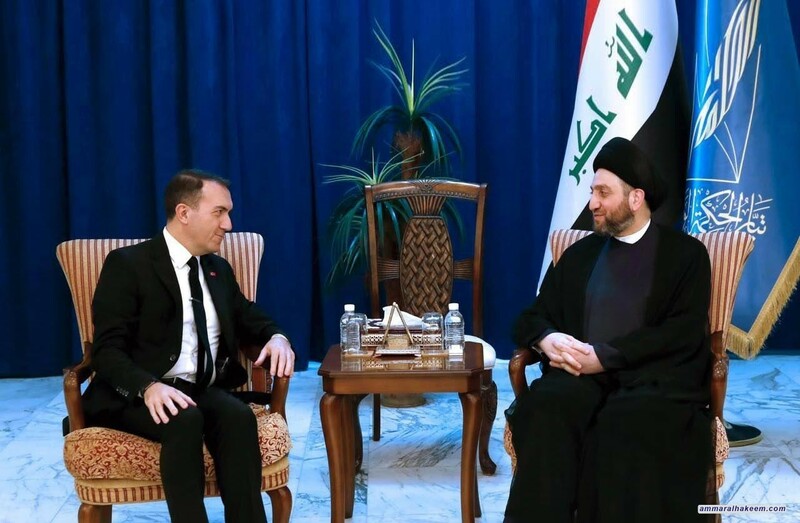 Regarding the water issues, his eminence reiterated his call for fair quota to Iraq from the Tigris and Euphrates Basin, indicated that Iraq rejects the policy of axes and supports a deep vision to the convergence of views.